This was one of the most enjoyable boxes that I have made so far. 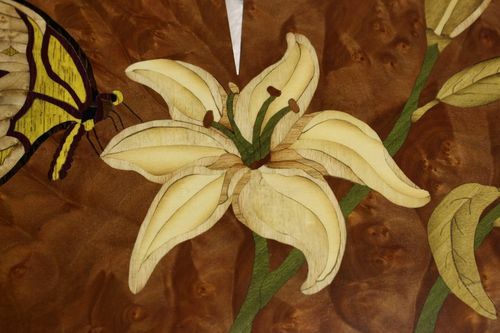 The butterfly and Lilies incorporated into the marquetry I have been wanting to do for a long time now. 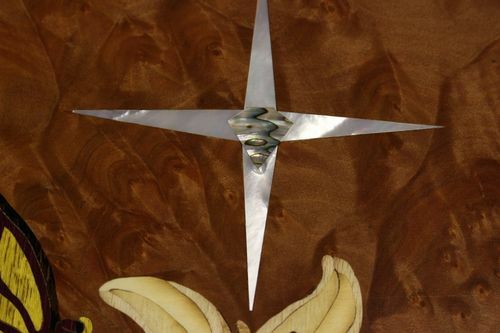 I inlayed some Mother of Pearl and Abalone on both top faces of the top to look like a Gem Star . I made this box for my wife Patti, because she likes to make jewelry. The trays are used to store gem’s, pearls, and other parts to make bracelets necklaces and ear rings. The hardwood is out of Wenge and the box is veneered with Pelin burl, the marquetry is out of Dyed yellow, black, green veneer, Walnut burl, purple heart, Wenge, birds eye maple Holly, and white oak. The box size is 7” Tall x 11” Wide x 17” long. Thank you for looking, and happy Woodworking!!!!! Dennis, what a beautiful box. The shape is so attractive. 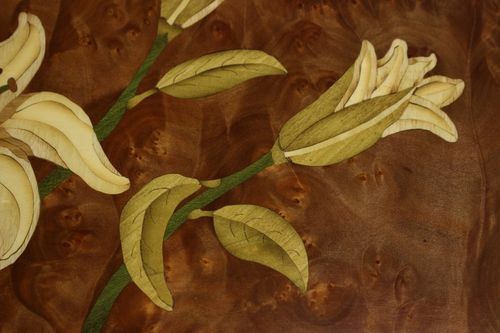 The marquetry takes it over the top. Fabulous. Absolutely amazing Dennis. You have created such detail and precision in this box. 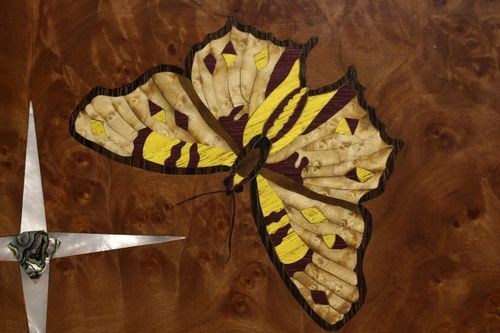 Spectacular work, Dennis… especially the marquetry! You just set the bar up another notch! My oh my that is one beautiful box, although I don’t know if I would realy call it a box ! There has got to be some kind of French word as it sits there. Dennis, this is an outstanding build. Words simply cannot describe the beauty of this box. Exceptional Work, Dennis. While I was admiring your box, I showed it to my 5 year old granddaughter, and she loves it, too. The butterflies really got her. Funny, she asked me if I could build a walnut box like that for her, too, and I never stated the box was made from walnut…..I guess she’s been in the shop with me a few times… I would love to see a blog or some additional build pics of this box if you have them. As with most of your projects….added to favorites. Particularly nice one Dennis. I really like the shaped base and I’ve become a big fan of pelin burl. I used it inside one of my chart boxes, gorgeous stuff. 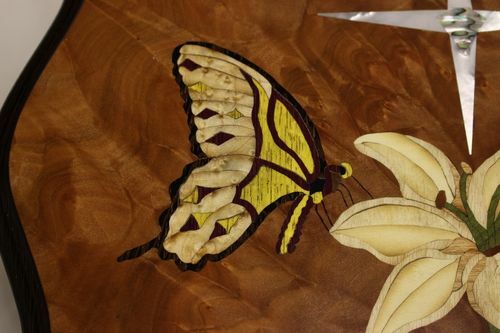 Your butterflies could fly right off the lid ….. so real. Keep up the great and inspirational work. We all love to see your projects. Man that is a beautiful box—just beautiful! If you’re gunna keep building them like this, I expect another book! You, my friend, are definitely one of the finest craftsman I know. Your work is absolutely outstanding. This box is the type of thing I will aspire to once I actually have time. Absolutely gorgeous! I have a plastic tackle box for my wood beads. (said in the same tome Charlie Brown used when he says “I got a rock” when trick-or-treating. I’ve only myself to blame for pressing my nose to the grindstone hard enough to lose it, figuratively speaking. I have wood and will soon finally have time to play with it. My last day of employment is 10/30/14…I’m retiring. Beautiful box. As always, you raise the bar for them rest of us.